This upcoming weekend, fellow fans of vintage Universal Studios monster films and classic comedy will be in for a real treat (of horror and hilarity)! “Svengoolie” (Rich Koz) will be presenting “Abbott & Costello Meet Frankenstein” this Sat. night at 10/9 Central on Me-TV. Iconic Chicago/Berwyn-based horror film host Svengoolie will showcase the comedic duo’s 1948 horror farce this Sat., Oct. 29 at 10 p.m. Eastern/9 p.m. Central on Me-TV Network. Lenore Aubert played mad scientist Dr. Sandra Moray, Jane Randolph played Joan Raymond, Frank Ferguson played Mr. McDougal and Charles Bradstreet portrayed Dr. Stevens. This was the first of several features that Bud Abbott and Lou Costello made as a cross-over with the iconic Universal monsters. Other tie-in films included “Abbott and Costello Meet The Invisible Man” in 1951 and “Abbott and Costello Meet The Mummy” in 1955, which was the duo’s final feature film for Universal. Though Boris Karloff did not reprise his iconic role of Frankenstein’s monster in “Abbott & Costello Meet Frankenstein,” the actor agreed to help publicize the film, according to a recent Turner Classic Movies article on the film. Karloff helped promote Abbott & Costello’s film away from the screen through publicity photographs, including one where the actor stood in a long line to buy a movie ticket so that he could experience “Abbott and Costello Meet Frankenstein” on the big screen. After the release of “Abbott and Costello meet Frankenstein” in 1948, the duo would appear in two other Universal comedic thrillers with Karloff- “Abbott and Costello Meet the Killer: Boris Karloff” (1949) and “Abbott and Costello Meet Dr. Jekyll and Mr. Hyde” (1953). 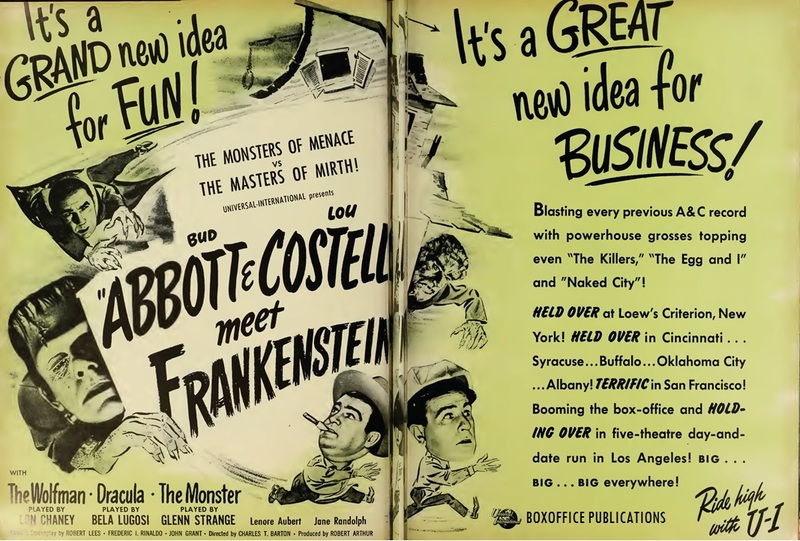 Universal trade ad for “Bud Abbott and Lou Costello meet Frankenstein” (1948). Fellow fans of vintage comedy and vintage horror will enjoy the upcoming presentation of “Abbott and Costello Meet Frankenstein” (1948) on Svengoolie’s showcase of vintage horror films (broadcast nationwide on Me-TV). Even if you’ve never watched “Svengoolie” before, “Abbott and Costello Meet Frankenstein” is a good starter film for those that have never seen his Saturday evening showcase of vintage Universal horror and sci-fi features on Me-TV (or for those who have never watched a vintage Universal horror feature). It is one of many spectacular horror films to kick off Halloween! Audiences young and old will enjoy the antics of Bud Abbott and Lou Costello (with Frankenstein’s monster, the Wolf Man and Dracula), along with Sven’s hilarious commentary, film facts, songs (with Doug Graves) and mail call segment (with Kerwyn)- all the way from Berwyn! 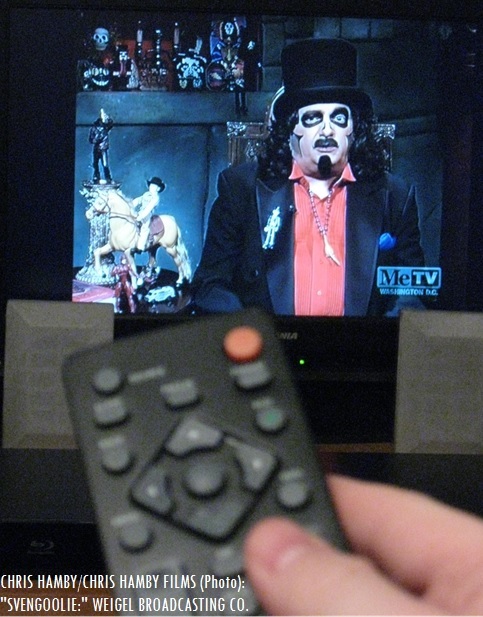 I have introduced several fellow friends to Svengoolie on Me-TV, and they have enjoyed every minute of his Universal horror/sci-fi showcase. When I officially entered the world of Twitter after starting this blog site (which was originally created for my Online Journalism class that I was taking at Hood College last year), I have made many more fellow friends who are also fans of Svengoolie, including fellow fans of classic/cult cinema and vintage horror! From Walkersville to Berwyn, the management of “Silver Screen Reflections” salutes Svengoolie and his Saturday evening Universal horror showcase on Me-TV! Worried that you’ll miss Svengoolie’s presentation of “Abbott & Costello Meet Frankenstein?” Turner Classic Movies will be showing the duo’s 1948 Universal horror farce this Sunday (Oct. 30) at 10 p.m./9 p.m. Central right after TCM’s presentation of Mel Brooks’ 1974 landmark horror spoof, “Young Frankenstein” (as part of the network’s Sunday salute to vintage Frankenstein films- the final conclusion will be the comedic side of Frankenstein’s monster)! Questions/Comments about “Svengoolie” or “Bud Abbott & Lou Costello Meet Frankenstein?” Drop a line at the comments section! SIDEBAR (For all posts): The author of this site does not endorse/approve any WordPress political advertisements. The author of this blog is not affiliated with any of the advertisers on WordPress.